After two and a half years in the woods, in July 1944, the Bielskis learnedthat the Germans, overrun by the Red Army, were retreating back towardBerlin. More than one thousand Bielski Jews emerged — alive — on that final,triumphant exit from the woods. Everyone knows about Oskar Schindler and his list, but the heroism of the Jewish brothers Tuvia, Asael and ZusBielski has largely been unsung. 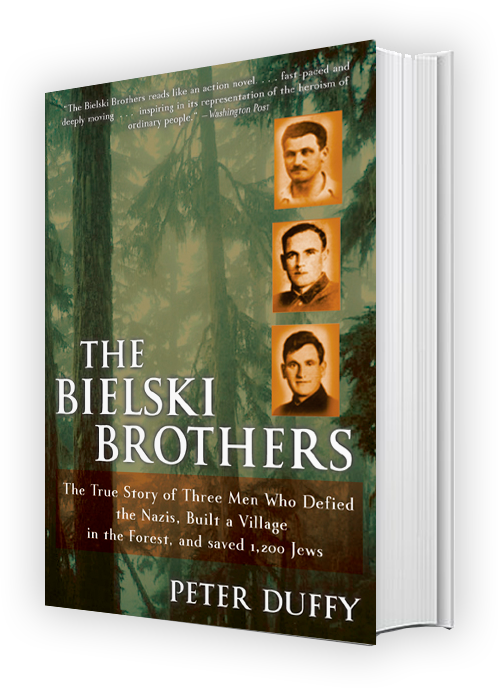 In World War II, the Russian trio saved 1,200 Jews from death camps by hiding them in a village they created in a forest in Belarus. The village, one Polish survivor recalled, “was like Minsk,” a thriving cultural center. This moving account reports how the Jews at the camp evaded both nearby traitors and Nazis, who at one point came after them with a 900-man commando unit. After writing a magazine article about the brothers, Mr. Duffy tracked down family members and survivors in the United States, Europe and Israel and uncovered documents including Tuvia Bielski’s unpublished memoir. He weaves it all skillfully into an engrossing, inspiring narrative, one, however, that is not without blemishes: Obsessed with survival, Tuvia unabashedly wielded power, even killing one of his Jewish rivals. Duffy´s book is an act of restoration, if not of resurrection, tipping the scale to the side of historical rectitude, shedding a steady light on the formidable story of forest Jews too long hidden in the shadows. Although Duffy conveys the thrill and travail of their extraordinary act of defiance, he is not loath to discuss the moral compromises and peccadilloes, even acts of moral outrage, the Bielskis occasionally committed. He gives us the full chiaroscuro effect, painting both the hues of light and shadow that constitute a picture of heroism in extremis.